1. Day 1 of Obama's Magical Media Tour: All Air Outside the Paint! A great first day on national television news for Barack Obama as he began his much-hyped overseas trip with a stop in Kuwait before moving on to Afghanistan. CNN anchor Rick Sanchez, seemingly channeling the media's own excitement, on Saturday night hailed it as "a trip that seems to be captivating the rest of the world as much, if not more so, than many in the United States." 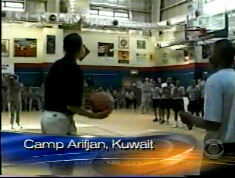 ABC, CBS and CNN showcased video of Obama making a basketball shot at a gym with troops in Kuwait. Over video troops cheering Obama as he walked into the gym, on ABC's World News Jim Sciutto touted: "Though the destinations were new, the greeting was familiar. Senator Barack Obama signing autographs with soldiers on his first stop in Kuwait, even taking time to play some basketball..." Forrest Sawyer, anchoring the CBS Evening News on Saturday night, highlighted how Obama "sank a shot from way outside the paint." Sawyer announced over matching video: "Now, before Afghanistan Senator Obama stopped off in Kuwait to talk to the troops there. You remember all that grief Obama got for being a terrible bowler? Well, at a local gym someone handed him a basketball and he promptly sank a shot from way outside the paint. He made it look easy." For the second night in a row, on Sunday night the ABC, CBS and NBC evening newscasts all led with Barack Obama's overseas trip as CBS Evening News anchor Forrest Sawyer trumpeted: "Tonight, Barack Obama on the U.S. challenge in Afghanistan, laying out the stakes in an exclusive CBS News interview." Reporter Lara Logan set up a condensed version of her interview which had consumed the first ten minutes of Face the Nation: "Speaking out for the first time since arriving in Kabul this weekend, Senator Barack Obama offered a bleak assessment of the worsening conditions inside Afghanistan." On ABC's World News, anchor David Muir led with how "Barack Obama is calling it one of the biggest mistakes made in the war on terror: The Bush administration's decision to focus on Iraq rather than Afghanistan." NBC Nightly News anchor Lester Holt admired Obama's need to walk on a "diplomatic and political tight rope, trying to balance his role as a U.S. Senator versus that of a presidential candidate" before heralding: "His words tonight are reverberating from the war fronts in Afghanistan and Iraq to the Pentagon." 3. 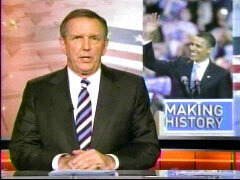 Anchors w/ Obama 'Not Like N. Korean TV with Kim Jong Il' Really? 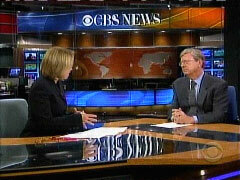 Will Katie Couric be as tough with Barack Obama as North Korean television is with Kim Jong Il? The last time Couric (and the other anchors to, for that matter) interviewed Obama the liberal Democrat had no more to fear from her and them than the communist dictator ever has from his state media. Pressed at the TV critics session with the networks in Beverly Hills on Friday as to whether ABC, CBS and NBC sending their anchors along with Barack Obama on his overseas trip is "justified or reflect media infatuation with the presumptive Democratic nominee," the AP's Lynn Elber reported CBS News correspondent Jeff Greenfield predicted: "I have a strong hunch the people interviewing Obama will have tough questions. It's not like North Korean television covering (communist leader) Kim Jong Il." Couric, also appearing via satellite from New York City, promised: "It's not going to be like, 'How do you like the weather in Jordan, Senator?'" Yet, when Couric last sat down with Obama, back on June 4 when he had become the presumptive nominee, Couric was so giddy she couldn't complete her question: "Did you ever think you'd see this day? I mean, are you still just completely-"
Toward the end of the lead story on Friday's CBS Evening News about Barack Obama embarking on a trip to the Middle East and Europe, Jeff Greenfield acknowledged: "This saturation coverage has already led the conservative blogosphere to offer blistering critiques of a liberal media slavishly treating Obama as a pop star." But, Greenfield assured anchor Katie Couric, who, along with Brian Williams and Charles Gibson, will accompany Obama, "the sheer presence of media in no way guarantees favorable coverage. In some ways, it makes the possibility of a misstep that much more dangerous." That prompted a worried Couric to wonder: "What do you think is the biggest potential landmine for him?" When Greenfield advised that Obama "doesn't have to equal McCain" in foreign policy expertise, "he just has to make voters seem like he's okay, he knows what he's talking about," Couric chirped in: "Especially if he draws big crowds, right? That might help him as well." Greenfield insisted: "I think the sight of an American politician being cheered in Europe at this stage would probably be welcomed by most Americans." Couric had cheerily led her newscast: "Barack Obama, the presumptive Democratic nominee for President, is about to begin a major overseas tour designed to bolster his foreign policy and national security resume, and help him be seen as a credible Commander-in-Chief and potential leader of the free world..."
The media imbalance in favor of Barack Obama over John McCain is so great, Washington Post media writer Howard Kurtz observed as he hosted CNN's Reliable Sources on Sunday, that he warned "there could be a big backlash against news organizations if this trend continues." He charged that "the media in general, not just the networks, are -- seem to me to be covering Obama as if we already President." 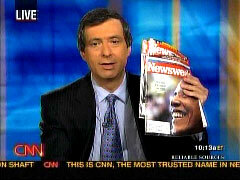 To illustrate how much the media are in love with Obama, Kurtz held up a bunch of Newsweek magazines with Obama on the cover: "You have one candidate, Barack Obama, getting more than twice as many covers, Time and Newsweek, than John McCain -- and just look at some. We pulled out some Newsweek covers here. Look: Obama. Obama. Obama. It's a small picture. Obama. Obama. At that point, there is clearly an imbalance. The sheer volume becomes an imbalance..."
CNN personalities Jack Cafferty and Howard Kurtz made a sudden confession of the mainstream media's imbalanced coverage of Barack Obama versus John McCain on Thursday's The Situation Room. First, in his 5pm Eastern hour "The Cafferty File," Cafferty labeled the media's planned coverage of Obama's first overseas trip since becoming the presumptive nominee an "extravaganza." He then gave some disclosure concerning the breakdown of the coverage between the two presidential candidates: "The three broadcast network newscasts, which have 20 million viewers combined, spent about 114 minutes covering Obama since June, compared to 48 minutes for McCain. Obama's been on the cover of Time and Newsweek 12 times in the last three years -- five for John McCain." Despite this admission, Cafferty gushed as predicted that Obama would be received in Europe "like the Rolling Stones tour coming to town." Later in the hour, Kurtz picked up the same theme and gave some more details about the imbalance in coverage in another report. On Friday's CBS Early Show, correspondent Shelia Macvicar reported on Barack Obama's upcoming international tour and declared: "Senator Obama is taking to the skies to stride on the world stage. It's a chance for Americans to take a look at how he measures up as a statesman...it's an attempt to demonstrate he has the necessary gravitas to maneuver through diplomatic minefields, especially in the Middle East." Macvicar then explained how well-received Obama's troop withdrawal plan would be to the Iraqi people: "...people know he has proposed to withdraw all U.S. combat troops within 16 months. American presidents have not been popular here for nearly 20 years. But Iraqis say they do want U.S. troops to go home. 'I'm for withdraw now,' says this shopper. 'The Americans have caused all our problems.' 'If Obama's plan is true,' he says, 'we bless it. We need withdraw today.'" Good Morning America reporter Claire Shipman on Friday worried that Al Gore's occasional kind word about John McCain might result in the election of the Republican. Interviewing the former Vice President about his new energy proposals, the ABC correspondent fretted: "And some Democratic eyebrows have been raised at your praise of John McCain. Democrats worried that maybe you're, you're going to help him get elected." That question, which hit Gore from the left, was one of the few, even slightly challenging queries. Instead, Shipman tossed softballs, such as asking: "Do you think that, right now, climate change is as much a threat to our country as terror?" The ex-VP asserted that "the climate crisis is by far the most serious threat we have ever faced" and Shipman offered no follow-up. She failed to ask Gore for some sort of evidence to back up this claim or to point out that terrorism killed 3,000 people on 9/11 alone. (How many have died from the "climate crisis?) Shipman simply fawned over the Democratic politician and cooed: "Many people are also talking about the fact that you would make an incredibly effective environmental czar either for Barack Obama or John McCain. Is that the sort of job that would interest you?" All Air Outside the Paint! A great first day on national television news for Barack Obama as he began his much-hyped overseas trip with a stop in Kuwait before moving on to Afghanistan. CNN anchor Rick Sanchez, seemingly channeling the media's own excitement, on Saturday night hailed it as "a trip that seems to be captivating the rest of the world as much, if not more so, than many in the United States." "Now, before Afghanistan Senator Obama stopped off in Kuwait to talk to the troops there. You remember all that grief Obama got for being a terrible bowler? Well, at a local gym someone handed him a basketball and he promptly sank a shot from way outside the paint. He made it look easy. You just have to pick the game." "Let me give you a quick set up on this next piece of video. Senator Obama goes into the gym afterward and shoots a free-throw. Then he mingles with some of the soldiers. One female soldier, in particular, challenges him to try and do it again. Now, watch this as it plays out." CBS will get the first "exclusive" even before each of the three anchors have exclusives for the day with Obama in the upcoming week. On Saturday's CBS Evening News, Sawyer twice plugged Lara Logan's "exclusive" Obama interview to air Sunday morning on Face the Nation. For the second night in a row, on Sunday night the ABC, CBS and NBC evening newscasts all led with Barack Obama's overseas trip as CBS Evening News anchor Forrest Sawyer trumpeted: "Tonight, Barack Obama on the U.S. challenge in Afghanistan, laying out the stakes in an exclusive CBS News interview." Reporter Lara Logan set up a condensed version of her interview which had consumed the first ten minutes of Face the Nation: "Speaking out for the first time since arriving in Kabul this weekend, Senator Barack Obama offered a bleak assessment of the worsening conditions inside Afghanistan." On ABC's World News, anchor David Muir led with how "Barack Obama is calling it one of the biggest mistakes made in the war on terror: The Bush administration's decision to focus on Iraq rather than Afghanistan." NBC Nightly News anchor Lester Holt admired Obama's need to walk on a "diplomatic and political tight rope, trying to balance his role as a U.S. Senator versus that of a presidential candidate" before heralding: "His words tonight are reverberating from the war fronts in Afghanistan and Iraq to the Pentagon." Logan concluded her Evening News story from Kabul by relaying his reassuring priority: "Obama told us that the main focus of the U.S. war against terrorism has to be Afghanistan and he said his mission here as President would be to disable al-Qaeda and the Taliban so they can no longer target the U.S. or its allies." For "Day 1 of Obama's Magical Media Tour: All Air from Outside the Paint!" see #1 above. Muir opened the Sunday, July 20 World News: "Good evening. Barack Obama is calling it one of the biggest mistakes made in the war on terror: The Bush administration's decision to focus on Iraq rather than Afghanistan. And Obama had a captive audience today as he sat down with the President of Afghanistan. Hamid Karzai. Obama's trying to sharpen his policy differences with John McCain on this, his second day of his foreign tour..."
Holt led NBC Nightly News: "Good evening, everyone. Barack Obama's venture onto the world stage has already proven to be a walk onto a diplomatic and political tight rope, trying to balance his role as a U.S. Senator versus that of a presidential candidate. He came face-to-face in Kabul today with the leader of Afghanistan to talk about a resurgent Taliban. But Obama is also talking U.S. policy and his own vision of the future of American military power in the region. And his words tonight are reverberating from the war fronts in Afghanistan and Iraq to the Pentagon..."
TV with Kim Jong Il' Really? Pressed at the TV critics session with the networks in Beverly Hills on Friday as to whether ABC, CBS and NBC sending their anchors along with Barack Obama on his overseas trip is "justified or reflect media infatuation with the presumptive Democratic nominee," the AP's Lynn Elber reported (as did the Washington Post's Lisa de Moraes) CBS News correspondent Jeff Greenfield predicted: "I have a strong hunch the people interviewing Obama will have tough questions. It's not like North Korean television covering (communist leader) Kim Jong Il." Couric, also appearing via satellite from New York City, promised: "It's not going to be like, 'How do you like the weather in Jordan, Senator?'" Yet, when Couric last sat down with Obama, back on June 4 when he had become the presumptive nominee, Couric was so giddy she couldn't complete her question: "Did you ever think you'd see this day? I mean, are you still just completely-" Pressing Obama about picking Hillary Clinton as his VP consumed five of her seven questions aired in the CBS Evening News excerpt. No doubt Couric, Gibson and Williams will be tougher this week if only to show they are not totally in the tank for Obama. Toward the end of the lead story on Friday's CBS Evening News about Barack Obama embarking on a trip to the Middle East and Europe, Jeff Greenfield acknowledged: "This saturation coverage has already led the conservative blogosphere to offer blistering critiques of a liberal media slavishly treating Obama as a pop star." But, Greenfield assured anchor Katie Couric, who, along with Brian Williams and Charles Gibson, will accompany Obama, "the sheer presence of media in no way guarantees favorable coverage. In some ways, it makes the possibility of a misstep that much more dangerous." That prompted a worried Couric to wonder: "What do you think is the biggest potential landmine for him?" "Good evening, everyone. Barack Obama, the presumptive Democratic nominee for President, is about to begin a major overseas tour designed to bolster his foreign policy and national security resume, and help him be seen as a credible Commander-in-Chief and potential leader of the free world..."
Following her discussion with Greenfield, Couric boasted: "We'll have the fist one-on-one interview with Senator Obama after he leaves Iraq." 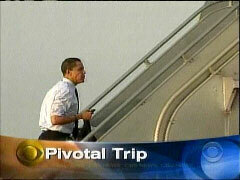 ABC's World News and the NBC Nightly News on Friday evening ran stories on Obama's trip, but didn't lead with it. 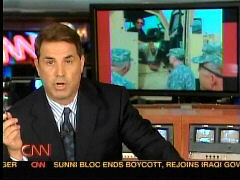 ABC began with "soaring air fares" and NBC with talk about time targets for when troops might leave Iraq. KATIE COURIC, IN OPENING TEASER: Tonight, Barack Obama stepping onto the international stage for the first time since he clinched the Democratic nomination. A high-stakes tour that will take him to two war zones, as John McCain challenges his war judgment. COURIC: Good evening, everyone. Barack Obama, the presumptive Democratic nominee for President, is about to begin a major overseas tour designed to bolster his foreign policy and national security resume, and help him be seen as a credible Commander-in-Chief and potential leader of the free world. Senator Obama will be visiting two countries where America is at war: Iraq and Afghanistan. He'll also make stops in Israel and Jordan and in Europe. He'll talk with the leaders of Britain, France, and Germany. Our senior political correspondent Jeff Greenfield tells us there is a lot riding on this trip. JEFF GREENFIELD: A traveling candidate is a familiar sight, of course, but Senator Obama's next trip is different from any trip any candidate has ever taken, with profound political possibilities and pitfalls. On the first leg of the trip, to two war zones, Obama is expected to meet with U.S. and Iraqi military leaders, including the commander on the ground, General Petraeus. Which poses a challenge: How to navigate between Obama's pledge to end the war and a successful surge he once opposed. McCain raised that question today. JOHN MCCAIN: He opposed the surge, he said the surge wouldn't work, and fails to acknowledge that it's working today. 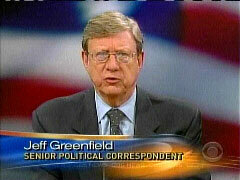 GREENFIELD: The second part of Obama's trip will be a campaign-funded visit to Europe and the Middle East. He'll meet with Israeli and Palestinian leaders, walking a fragile diplomatic tightrope. 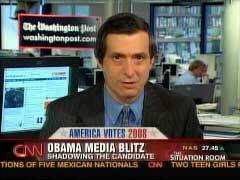 JOE TRIPPI, CBS NEWS POLITICAL ANALYST: This is a high-stakes game for Obama. He doesn't want to make any mistakes. Certainly, if he does make one, make a statement that causes a problem, it will be a huge one. GREENFIELD: But with voters concerned about the freshman Senator's foreign policy and national security experience, Obama has little choice but to take the overseas gamble to shore up his credentials. For its part, the McCain camp was on the attack with a new ad. CLIP OF AD: He hasn't been to Iraq in years. Now, Obama is changing to help himself become President. GREENFIELD: There's little question that throughout this trip Senator Obama will be walking a fine line. TRIPPI: You want to look presidential, but you don't want to look like you're President. That could be presumptuous, and it could backfire here with the electorate. GREENFIELD: This saturation coverage has already led the conservative blogosphere to offer blistering critiques of a liberal media slavishly treating Obama as a pop star. But, of course, Katie, the sheer presence of media in no way guarantees favorable coverage. In some ways, it makes the possibility of a misstep that much more dangerous. COURIC: Of course, he does, as you mention, have to walk some tightropes. What do you think is the biggest potential landmine for him? GREENFIELD: You know, I think it's everything from an untoward photo opportunity -- Dukakis in a tank -- to a misstatement that makes it seem to critics that he really does not know the nature of the terrain that he's talking about. COURIC: And while the political benefits are many, i.e., you know, visuals of him appearing statesmanlike with a variety of world leaders, can a single trip wipe out the perception in the minds of some that he lacks the credentials in foreign policy? GREENFIELD: Assuming he doesn't come back with a Mideast peace plan that everybody signs on to, which is unlikely, no, but it can neutralize the fears. He doesn't have to equal McCain in that stature, he just has to make voters seem like he's okay, he knows what he's talking about. COURIC: Especially if he draws big crowds, right? That might help him as well. GREENFIELD: I think the sight of an American politician being cheered in Europe at this stage would probably be welcomed by most Americans. Let me give you my two cents. When you have one candidate whose trip is covered by the three anchors, and the other candidate, whose foreign travels are barely covered, when you have one candidate who gets twice as much air time on the network evening newscasts since early June, since the Democratic contest was over -- that being Obama versus McCain -- when you have one candidate, Barack Obama, on the cover of Rolling Stone with his wife on US Weekly, with his family on Access Hollywood, and when you have one candidate, Barack Obama, getting more than twice as many covers, Time and Newsweek, than John McCain -- and just look at some. We pulled out some Newsweek covers here. Look: Obama. Obama. Obama. It's a small picture. Obama. Obama. At that point, there is clearly an imbalance. The sheer volume becomes an imbalance. And I think that we have inadvertently or otherwise put our thumb on the scale and there could be a big backlash against news organizations if this trend continues. Besides giving the details of the major differences in coverage between the two presumptive presidential candidates, Cafferty gave the scope of the demand in the mainstream media to cover Obama's trip overseas: "All three broadcast network anchors will join him, broadcasting their nightly newscasts from stops along his route. Also along, to record Obama's every move, are top political reporters from major newspapers and magazines all over the country. Two hundred journalists requested to accompany Obama on the trip. But the campaign says they're only going to be able to accommodate about 20 percent of that number, or around 40 or so." Cafferty also tried to give a justification for this gap between the candidates: "The television executives, of course, have lots of reasons for why the Obama trip is such a big deal. It's his first overseas trip since becoming the presumptive nominee; he's a fresh face in politics; his campaign is historic; and he's the first African-American to ever head a major ticket in the run for the White House; and there is an overwhelming interest in Barack Obama overseas. Those are all valid reasons. But that doesn't mean John McCain has to like any of it." He then proposed his "Question of the Hour:" "Why does Barack Obama get more news coverage than John McCain?" After proposing this question, Cafferty turned to Blitzer and told him about Gallup's prediction that "[Obama's] trip... has the potential to change the race. Those are their words." When Blitzer asked what was meant by this, Cafferty answered, "Well, I guess it would have the potential to go either way. But I got the feeling, reading what they were writing, is that if he doesn't make any huge mistakes, he could do himself a lot of good here." Blitzer replied, "Because you know he's going to be very, very enthusiastically received in Europe. There's no doubt about that." Cafferty agreed with this prediction: "They can't wait. I mean, it's like the Rolling Stones tour coming to town." About forty minutes later, Kurtz gave the following report about the upcoming media "extravaganza" surrounding Obama's trip. At one point, he bluntly indicated that the Big Three networks were doing "exactly what the Obama camp wants." KURTZ: The three broadcast network anchors will travel halfway around the world, lured by an offer of interviews with the candidate, with Katie Couric, Brian Williams, and Charlie Gibson getting an exclusive on successive nights. That means the CBS, NBC, and ABC evening newscasts will do exactly what the Obama camp wants -- use their big megaphones to certify the trip as a major campaign event. The television chatter is already starting, including on CNN, which will also be all over the story. BILL SCHNEIDER, CNN SENIOR POLITICAL ANALYST (file video): Obama will shortly be heading to the Middle East, and intends to show how much he knows about the threats the U.S. faces. CHRYSTIA FREELAND, FINANCIAL TIMES (from MSNBC): The economy is in bad shape, but I think this trip by Obama is risky, but brilliant. KURTZ: Of course, it's always big news when a presumed presidential nominee travels abroad, right? Wrong -- John McCain has taken three trips abroad to Europe, the Middle East, Canada, Colombia, and Mexico in the last four months. No anchors tagged along. In fact, some broadcast and cable networks didn't even send correspondents on some of these trips. The imbalance doesn't end there. Obama has received more than twice as much air time as McCain on the network evening newscasts since last month, although more coverage doesn't always mean positive coverage. Obama, who is on the cover of Newsweek again this week, has been on Time or Newsweek's cover a dozen times in the last three years, more than twice the amount of McCain. And in some venues, Obama and his wife Michelle on the cover of Us Weekly, Obama and his family on â€˜Access Hollywood.' It's not even close. KURTZ (on-camera): With Obama expected to draw big crowds in Europe next week, McCain may struggle to stay in the headlines. Now, journalists say much of this is driven by the novelty factor. Obama is a new player on the world stage, while McCain has been making international trips for decades. But at what point does that become unfair? Wolf? 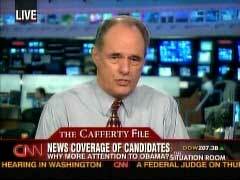 Immediately after Kurtz's report, Cafferty read some of the viewer replies to his "Question of the Hour." Two of the replies are worth noting. A Bob in California wrote, "Real simple. The media hacks like you are selling the Obama con job." Another viewer named Laura used more subdued language, but made the same point: "Give me a break. Obama is no more exciting than anyone else. He's the same old thing wrapped in a different type of bow. The reason he gets more coverage is simple, and everything you and your colleagues have denied for months now is the reason -- media bias." Macvicar then looked at the rest of Obama's planned trip: "On to Europe where many are enthusiastic." She quoted one British citizen who claimed: "If there were a vote here in the UK he'd probably win something like 5-1." Macvicar concluded her report by observing: "There's no question...that even this far away Mister -- Senator Obama, more than any other recent presidential candidate, excites great interest." Macvicar did describe some of Obama's international incidents, one of which was the fact that Obama "angered Palestinians" by being too pro-Israel. Another was that: "...the German chancellor has accused him of overreaching, by trying to make a speech at Berlin's Brandenburg Gates... That's a location, the German government says, for elected presidents." Macvicar's fawning was somewhat countered by former Republican pollster Frank Luntz, who co-host Maggie Rodriguez talked to afterward and asked: "But who he needs to win over is not so much the people over there as people over here who have doubts about his foreign policy experience. How -- what are his challenges?" Luntz replied by pointing out that: " You've got to remember that Obama's only been a senator for three years. So a lot is at stake here." Rodriguez followed up by asking about Obama's numerous foreign policy advisors: "And you know he has, front page of the New York Times, a group of 300 people advising him on foreign policy. I'm sure that they have given him talking points on every possible issue that could come up, told him what to say." To that Luntz recalled past foreign policy failures by inexperienced Democratic presidents: "But so did John Kennedy when he negotiated with Nikita Khruschev. So did Jimmy Carter in his situation with Iran. And both of them, who had less foreign policy experience, both of them made serious mistakes in their administrations that cost the U.S. a lot." The final question from Rodriguez was: "Can John McCain even compete next week?" Luntz responded: "...McCain's been doing this for 30 years and I think that's what he needs to point out. Obama's taking his first international trip, his first significant trip. John McCain has been taking significant trips for 30 years." It is certainly hard for McCain to compete when all three network news anchors have decided to hop on Obama's campaign plane for the trip. MAGGIE RODRIGUEZ: In an effort to boost his foreign policy credentials, Senator Barack Obama plans to embark on a tour of Europe and the Middle East. CBS News correspondent Sheila Macvicar is in London this morning. Good morning, Sheila. BARACK OBAMA: And Jerusalem will remain the capital of Israel and it must remain undivided. MACVICAR: President Clinton proposed Jerusalem as the capital of both Israel and Palestine. Obama has had to back track, but Palestinians and Israelis have been left wondering if he really understands the complexity of their situation. On to Europe where many are enthusiastic. UNIDENTIFIED MAN: If there were a vote here in the UK he'd probably win something like 5-1. MACVICAR: But the German Chancellor has accused him of overreaching, by trying to make a speech at Berlin's Brandenburg Gates, symbolic of freedom. RONALD REAGAN: Mr. Gorbachev, open this gate. Mr. Gorbachev, tear down this wall. MACVICAR: That's a location, the German government says, for elected presidents. There's no question, Maggie, that even this far away Mister -- Senator Obama, more than any other recent presidential candidate, excites great interest. However, his meetings with presidents and prime ministers will be a little more formal. There's no point in building a very warm relationship if he's not the next inhabitant of the White House come January. Maggie. RODRIGUEZ: Alright, not just yet. Thank you. CBS's Sheila Macvicar in London, thank you. We're joined now by political analyst, Frank Luntz, author of 'Words That Work: It's Not What You Say, It's What People Hear.' Good morning Frank. FRANK LUNTZ: Nice to be here. RODRIGUEZ: Nice to have you. Tell us, what do you think is at stake during this trip? FRANK LUNTZ: I don't know of a time when a challenger has had the kind of exposure, the kind of focus, that Barack Obama has. This is more attention to a foreign trip than even President Bush would get. You've got politics involved, you've got personalities and policies. On the politics, this is a guy who the world community is watching. They're going to line up by the thousands to get a chance to wave at him. And you know that he's going to get a good public response in every country, with perhaps, the exception of Israel. In the policies, his positions are closer to these European and Arab nations than what the president's are. But one slip up, one mistake and John McCain will pounce. RODRIGUEZ: But who he needs to win over is not so much the people over there as people over here who have doubts about his foreign policy experience. How -- what are his challenges? LUNTZ: But his campaign is smart. Because they know that if the American people see Europeans applauding the U.S. after protesting us for the last five years, it's going to have a very positive effect. Conversely, if he shows, if he is shown not to have the kind of experience and to say something that might go wrong, that's the opening. You've got to remember that Obama's only been a Senator for three years. So a lot is at stake here. RODRIGUEZ: And you know he has, front page of the New York Times, a group of 300 people advising him on foreign policy. I'm sure that they have given him talking points on every possible issue that could come up, told him what to say. LUNTZ: But so did John Kennedy when he negotiated with Nikita Khruschev. So did Jimmy Carter in his situation with Iran. And both of them, who had less foreign policy experience, both of them made serious mistakes in their administrations that cost the U.S. a lot. That being said, you tell me a presidential candidate who's had all three network anchors following along for the ride. This is unprecedented. RODRIGUEZ: Can John McCain even compete next week? LUNTZ: Probably McCain's best response is just to go out and raise some money and wait and see what Obama says. Because McCain's been doing this for 30 years and I think that's what he needs to point out. Obama's taking his first international trip, his first significant trip. John McCain has been taking significant trips for 30 years. RODRIGUEZ: Frank Luntz, thank you so much. Good Morning America reporter Claire Shipman on Friday worried that Al Gore's occasional kind word about John McCain might result in the election of the Republican. Interviewing the former Vice President about his new energy proposals, the ABC correspondent fretted: "And some Democratic eyebrows have been raised at your praise of John McCain. Democrats worried that maybe you're, you're going to help him get elected." Shipman simply fawned over the Democratic politician and cooed: "Many people are also talking about the fact that you would make an incredibly effective environmental czar either for Barack Obama or John McCain. Is that the sort of job that would interest you?" Following up, she speculated, "Are you saying that some sort of cabinet post might, in fact, limit your ability to influence that issue?" 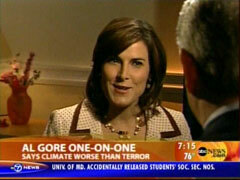 Gore also appeared in the 7am hour of NBC's Today show. In contrast, reporter Anne Thompson actually asked Al Gore some tougher questions, such as the logical query, how does he plan on accomplishing his energy goals? THOMPSON: Gore wants to start by setting a goal to generate all our electricity from renewable sources within ten years, like wind, solar and geothermal. How do we reach that goal? GORE: It's cost competitive now. The costs of coal and oil has been going up so rapidly and the scientific and engineering breakthroughs in renewable energy have brought the costs down. The lines are crossing. THOMPSON: But a complete shift to clean electricity would require a huge investment. To build transmission lines from wind and solar plants and upgrade the national grid. I understand that what you're talking about is up to $3 trillion investment over 30 years? GORE: Well, $1.5 to $3 trillion is what we would pay over that period of time if we were going to continue to rely on fossil fuels. It is an investment of both public and private funds that would repay itself many times over. The segment wasn't free of fawning, however. Thompson did compare Gore to legendary Green Bay Packer quarterback Brett Farve at the close of the piece: "I asked Gore if in watching Obama and McCain he feels a little bit like retired Packers' quarterback Brett Favre. Does he regret not running again, not getting in the game? He said, no. There are thing he misses about politics and things that he doesn't, but says his job now is to change people's minds about the climate crisis." ROBIN ROBERTS: Now, to Al Gore's big challenge to the presidential candidates to help solve our energy crisis. The former vice president wants the country to produce all of its electricity with Earth-friendly power sources within the next ten years. Our senior national correspondent Claire Shipman spoke to Gore about his ambitious plan and his new warning about how dire the situation is. AL GORE: Today, I challenge our nation to commit to producing 100 percent of our electricity from renewable energy and truly clean carbon-free sources within ten years. SHIPMAN: Do you think that, right now, climate change is as much a threat to our country as terror? GORE: Both are serious, must be addressed. That having been said, I think that the climate crisis is by far the most serious threat we have ever faced. SHIPMAN: You have praised both Barack Obama and John McCain for what they're talking about in terms of environmental policies and some Democratic eyebrows have been raised at your praise of John McCain. Democrats worried that maybe you're, you're going to help him get elected. GORE: Well, I've endorsed Barack Obama. I'm a Democrat. But I think that John McCain deserves credit for having provided some leadership in the Republican Party years ago at a time when it was needed. SHIPMAN: One of the things John McCain talks about is, in addition to pursuing alternative sources of energy, is renewed drilling and he makes the case that drilling can be environmentally safe now, it's the same sort of thing that President Bush says. GORE: Since the first oil crisis back in the early '70s, we've been told that if we simply go for more oil, gasoline prices will come down. We need to break free of this old pattern that's holding us back and develop the renewable sources that can bring about the equivalent of a dollar a gallon gasoline. SHIPMAN: You are on everybody's list as I'm sure you've seen, short list for VP. Want to do it again? GORE: Well, I -- you're looking at different lists than I am. I've decided to impose a personal term limit of two terms as vice president. SHIPMAN: Many people are also talking about the fact that you would make an incredibly effective environmental czar either for Barack Obama or John McCain. Is that the sort of job that would interest you? GORE: Well, now, the title of czar is intriguing. SHIPMAN: [Laughs] Is nice, in a different country maybe. GORE: Yeah. In all seriousness, I do see my role as one that's focused on changing public opinion. SHIPMAN: Are you saying that some sort of cabinet post might, in fact, limit your ability to influence that issue? GORE: I think my best use is in trying to change public opinion and get the facts out there and get the solutions out there. ROBERTS: Our Claire Shipman talking with the former Vice President.